Yesterday was National Kahlua Day. Oh yes, I celebrated with cupcakes! I made a moist chocolate cake, drenched it in Kahlua then topped it with a Kahlua buttercream and a dusting of chocolate. Oh heavens, it's almost too divine to eat. To read more about this cupcake or see more of my recipes, visit JavaCupcake.com! Kahlua – yes, a whole bottle. Preheat oven to 375 F degrees. Line your cupcake pan with liners. In the bowl of an electric mixer with the paddle attachment, mix together the oil, sugars, vanilla, and eggs until completely combined or about 2 minutes. Pour yourself a drink. 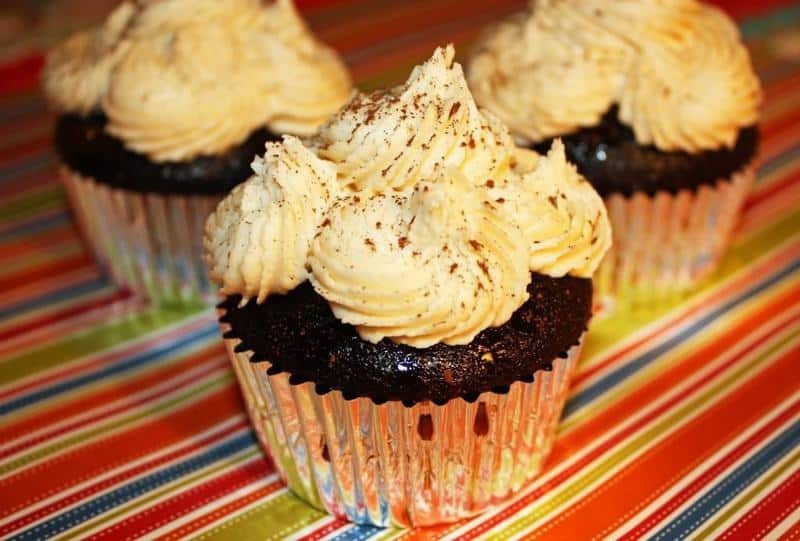 Yes, use the Kahlua you just bought for these cupcakes. Take a big drink. While they are mixing, whisk together the flour, cocoa, espresso powder, baking soda, baking powder and salt in a large bowl. Alternating flour and buttermilk, add the flour in thirds, beginning and ending with the flour. Scrape the sides and only mix until combined. Fold in the hot water and mix until combined. Bake for 10 minutes then rotate pan. Bake another 5 minutes. Who are we kidding here. By now, you’ll need to pour another drink to sip on while these are cooking. Cool in pans for 5 minutes then to a wire wrack to finish. While still warm, poke 8-9 holes in the cupcakes with a toothpic. Using a brush, drench the cupcakes with Kahlua. Three times. Yes, you want LOTS of Kahlua in your cupcakes. In the bowl of an electric mixer using the WHISK attachment, whip the butter. Do you still have your drink? Take a sip, or gulp. One cup at a time, add the sifted powdered sugar. Scraping the sides of the bowl after each addition and mixing until thoroughly combined. Between each addition of sugar, alternate between adding the Kahlua and milk. Whip on high for 2-3 minutes. Chill for 5-10 minutes before piping onto cupcakes. Dust each cupcake with dark chocolate cocoa powder. Pour one last drink, get a cupcake, and relax!